Enough for 4. Serve hot garnished with parsley and accompany with a side salad. Sprinkle the aubergine slices with salt and leave for 30 minutes. Cook the macaroni in boiling salted water for around 8 minutes until al-dente, drain. Rinse and dry the aubergines. Heat the oil in a large frying pan and quickly toss the aubergine and onion slices in the oil for 2 or 3 minutes. Add the garlic. Mix the yoghurt, milk and two-thirds of the cheese. 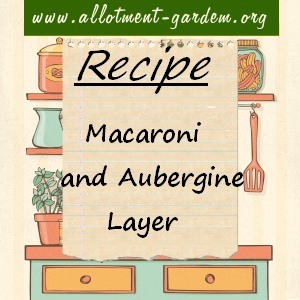 Layer the aubergine and onions, pasta and tomatoes in an oven-proof dish, seasoning the layers. Pour in the yoghurt mixture and top with the remaining grated cheese. Bake in a pre-heated oven at Gas Mark 5/190°C/375°F for about 45 minutes until golden. Serves 4. Accompany with a side salad.